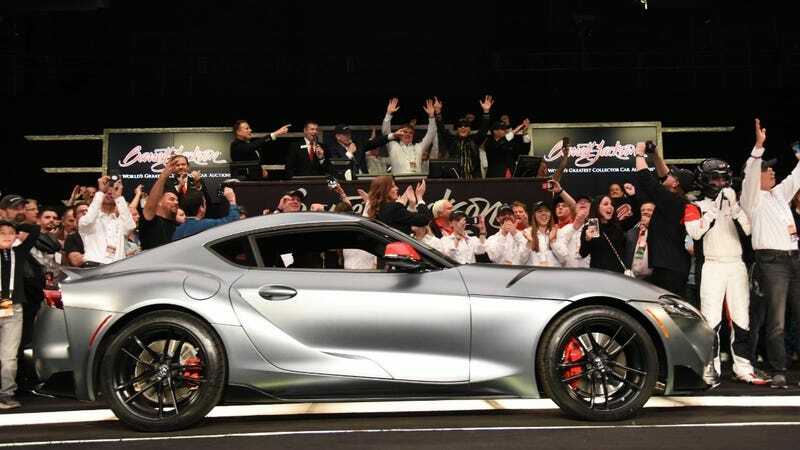 “Nobody at the coffee shop will remember you if we stop at one-million nine-fifty.” And that’s how a professional cattle rattle gets someone to pay the headline-winning price of just over $2 million for the first 2020 Toyota Supra off the production line. Thankfully this isn’t simply some display of vulgar opulence, as 100 percent of the hammer price for this car was donated to the American Heart Association and the Bob Woodruff Foundation to support veterans and service members. While this number is likely to spark some Toyota dealers to add a “market price adjustment” to MKV Supra allotments for the next year or so, it is not a limited production vehicle—outside of the limited-to-90 GR Supra—and should level out once those willing to pay the markup get their cars. The fact of the matter is, the person who bid this car up sky high at Barrett-Jackson is getting a huge tax deduction for the privilege. This car, for them, is like when you donate $50 to PBS and they send you a canvas tote bag. The Supra is the tote bag. Interestingly, however, the first Toyota Supra is a one-of-one in a special color. It’s a matte grey with red mirror caps, matte black wheels, and a bright red interior. The engine compartment has been signed by Toyota CEO Akio Toyoda, and just to tick the bid over a little more, he included the race shoes, suit, gloves, and helmet used to complete the final test of the Supra before signing off on production. Sadly, this particular Supra will likely never again be seen, simply sitting in someone’s climate controlled storage facility until the inevitable heat death of the universe. And this wasn’t the only huge over-payment for charity during B-J’s auctions last night. The first 2019 Ford GT Heritage sold for $2.5 million with the hammer price going to the United Way, and the first 2020 Ford Mustang Shelby GT500 sold for $1.1 million, which is going to the Juvenile Diabetes Research Foundation. In case you needed more convincing that the Supra was par for the course at one of these auctions, this customized 1981 Jeep CJ7 was bid up and sold, then the new owner donated the car back to be bid up again. Once the two bids and extra celebrity donations where totaled up, it sold for a whopping $1,310,000. These kinds of charity sales are not indicative of the invisible hand of the market dictating the car’s value. These are headline-creating attention-grabbing charity donations that probably do more to help these individual foundations than an anonymous donation of the same amount would, because it helps provide awareness for regular folks when it comes time to decide who they will donate to. Don’t worry about having to pay huge sums for these cars, they’re not “worth” any more because of a charity auction result. If Jeeps were magically worth $1.3 million all of a sudden, David Tracy would be buying everyone at the club a round of tall glasses of their finest milk.